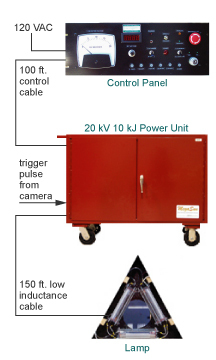 In this setup, the camera communicates directly with the power unit, which stores energy in a pulse-forming network. When the camera is ready to take pictures, it sends a trigger pulse to the power unit. The power unit, in turn, meters out a pulse to the modular lamp(s) at your required duration (from 30 µs to 1 ms). During this pulse, the camera automatically captures images. The light is generated by a series of modular lamps that can be placed up to 150 feet away from the power unit—ideal for situations involving explosives. Charging of the power unit is managed from the control panel, which can be installed in a convenient location up to 100 feet from the power unit.